In the old days, you didn’t have much choice when it came to picking a financial advisor because they were all human! These days, you can select between human advisors and robo-advisors, such as Betterment and Personal Capital. 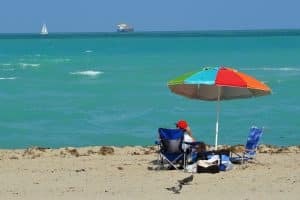 But regardless of which you choose, you should make sure you have a list of the most important questions to ask your financial advisor before you walk in the door and get mesmerized by glossy charts of rising stocks or speak with a sales representative who dazzles you with projections of rosy retirements. 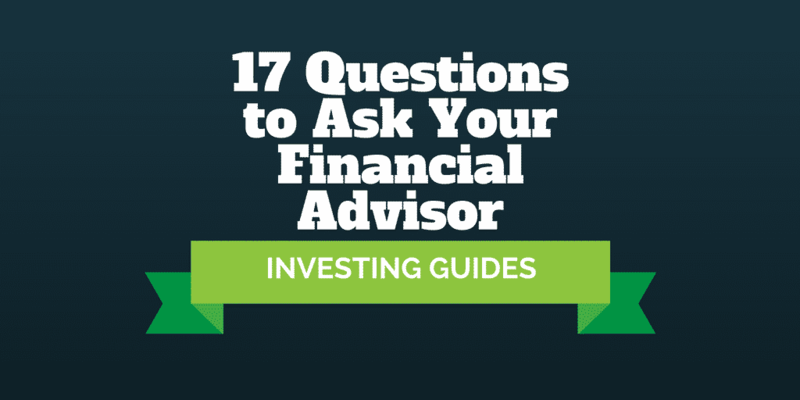 So, what are the most important questions to ask your financial advisor? 1. What Management Fees Do You Charge? 4. What Is Your Investment Methodology? 5. Do You Offer Tax-Loss Harvesting? 6. What Level Of Service Can I Expect? 7. What Is Your Experience Investing Client Assets? 8. What Licenses & Credentials Do You Hold? 9. How Much Do You Earn When I Buy An Annuity? 10. Are You A Fiduciary? 11. Where Is My Money Held? 12. What Information Do I Have Access To? 13. Is My Portfolio Transferred In-Kind? 14. Do You Invest My Money In Mutual Funds? 15. How Many New Clients Do You Take On Each Year? 16. What Is Your Succession Plan? 17. What Is The Profile Of Clients? Traditional financial advisors are increasingly fighting an uphill battle these days when it comes to fees. On average, human advisors charge advisory fees on managed assets north of 1%, though you can find many who will charge lower amounts, especially if you let them manage more of your money. The reason human advisors are increasingly pressured to lower annual fees is that the majority of robo-advisors charge significantly lower management fees. For example, one of the industry leaders, Betterment, charges approximately one quarter what human advisors charge. Plus, robo-advisors have become so sophisticated that they automate processes that are time-consuming for human advisors, such as harvesting tax losses and dynamically rebalancing portfolios. At first glance, you might think this question is the same as the first question, but it’s precisely that assumption financial advisors may hope you make so you don’t ask the tough questions! Financial advisors are required to disclose how they get paid when you ask, and while you might have made the assumption that they only earn income from the management fees charged to you, the reality is they may have other income streams you would otherwise never know about. When the doors close behind you, financial advisors often meet with mutual fund representatives who pitch them on the latest and greatest fund offerings. And when those funds find their way into your portfolio, your financial advisor may earn a kick back. After asking the first couple of questions, you might think this question is redundant. Haven’t you already found out everything you need to know about fees and how the financial advisor is getting paid? In addition to paying management fees to your financial advisor, you also will pay expense ratios and commissions costs on trading, plus other fees potentially. Expense ratios are the fees charged at the fund level by mutual fund operators. And the sneaky thing is you don’t ever really get to see these unless you look hard. You can always track expense ratio costs down but they aren’t reported on your quarterly financial statements, so they can be hard to uncover. Robo-advisors generally use low expense ratio funds and charge lower management fees than human advisors, but may pass on trading commissions costs to you. >> Related: What Are The Best Robo-Advisors For Fees? Investing is a tricky business because most investors do not beat major market averages over time after factoring in fees. It is so hard to beat the market that a reasonable goal is simply to track the performance of the market. 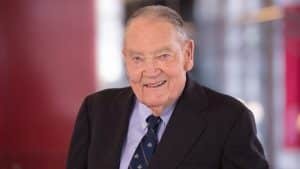 When Vanguard Group founder, Jack Bogle, first suggested a diversified portfolio would outperform the average “stock-picker,” he was ridiculed but over time he was proven right. You should ask your financial advisor whether they invest using Modern Portfolio Theory, which is based on Nobel-prize winning research. Almost all robo-advisors build client portfolios based on Modern Portfolio Theory, and generally use template portfolios depending on client risk tolerances. Some financial advisors will tailor portfolios to your own individual circumstances, which seems like a good idea until you realize that to do so for say 150 clients would be very difficult to manage well. Think about how hard it is for you to keep track of your own investments let alone the portfolios of 149 other investors simultaneously. Unless the financial advisor has a team of assistants, the reality is your portfolio may not remain balanced as time goes by because any human advisor will have a hard time keeping up. When you invest as part of a taxable account, you will usually have a sprinkling of winners and losers. The idea behind tax-loss harvesting is to sell losing positions to offset gains from selling winners. If you simply sold winning positions without selling the losers too, you may end up paying more in capital gains taxes. Many financial advisors focus on gross returns, and pay little heed to tax consequences, but the reality is the money you get to keep is net of paying Uncle Sam. Most good robo-advisors offer tax-loss harvesting as a complimentary service. 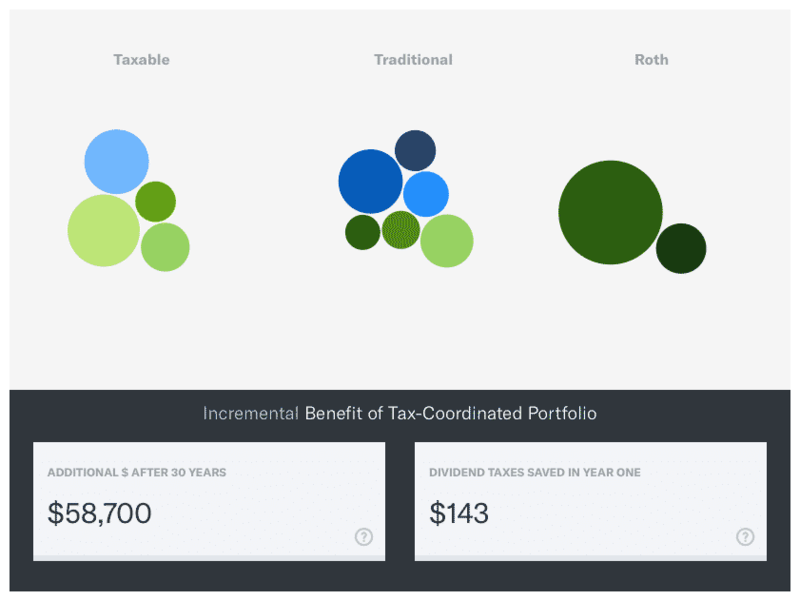 Betterment goes a step further with tax-coordinated portfolios that it claims can increase your portfolio value by as much as 15% over 30 years. Wealthfront also optimizes for tax impact with its Direct Indexing service, which essentially mimics the diversification of a fund using individual securities that can better optimize returns for tax impact. If you choose a robo-advisor, the level of service you can expect is usually clearly stated upfront. You may for example pay one fee-level for purely digital advice, and a higher fee if you want access to financial experts. When you select a traditional financial advisor, the level of service you can expect to receive may be a little more murky. Are you able to call your advisor when you feel panicky about a stock market crash? How often can you email them to receive portfolio performance updates? Will you meet with your financial advisor each quarter for regular updates? Or will you see them just once a year? It is better to define the terms of communication ahead of time so you are not left in the lurch when your money has already been invested in a diversified portfolio and it is costly to make changes. When the rubber meets the road, you want your financial advisor to be a rock of support. Investing can be an emotional business at the best of times with greed and fear often sweeping aside rationale and leading to poor decision-making if you are not careful. 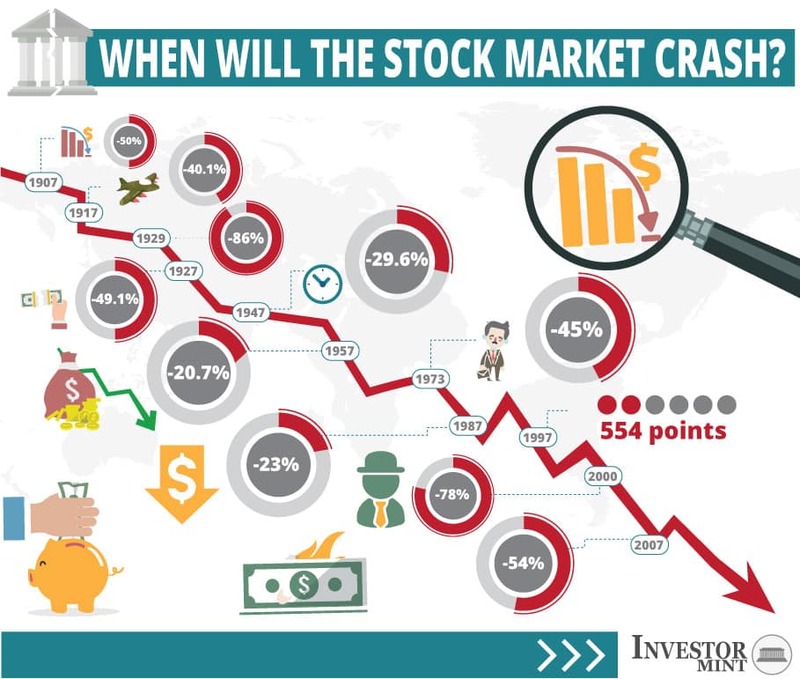 You want to be sure your financial advisor has seen the ups and downs of market cycles, experienced economic booms and recessions, and navigated a steady course throughout. Ideally, you want your financial advisor to be passionate about what they do, so you can be confident that they are constantly monitoring your portfolio when your attention is focused on your career. 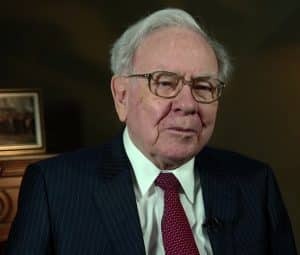 To glean insights into how connected they are to financial markets, ask some probing questions about recent financial events and quarterly reports or whether they have read investor letters, such as Warren Buffett’s annual Berkshire shareholder letter. >> Related: How Did Warren Buffett Get So Rich? Your financial advisor is licensed right? Well, you would hope so, but if you ever saw any of the frightful American Greed episodes on TV where con-artists persuade unsuspecting clients to hand over their life-savings despite holding no official credentials, you will know it is best to ask ahead of time for licenses than to be sorry later. If you are approaching retirement, an annuity can sound very appealing. After all, what’s not to like about a guaranteed stream of income each year for the rest of your life? Get ready to watch your financial advisor squirm uncomfortably in his/her seat because annuities can be among the highest earning products that financial advisors sell. It may be hard to fathom but if you were to purchase a million dollar annuity, your financial advisor may be pocketing as much as $50,000 or more from the sale. What you may not know is that your financial advisor and the annuity company are in cahoots so-to-speak where the advisor gets a very generous kickback from the annuity company after you hand over your hard-earned savings. Not all annuities are equal and not all financial advisors earn hefty sums from pitching annuities, but you should at the very least ask some probing questions before signing any documents. A fiduciary is a person who acts in your best interests. You might think that is similar to a non-fiduciary who is required to recommend “suitable” products but the difference is significant. Acting in your best interests is a higher standard of care than finding suitable investment products. Take the example of the annuity sale. An advisor who pitches you on the sale of an annuity and pockets $50,000 may argue that it is suitable for your financial goals, risk profile and circumstances. By contrast, a fiduciary may recognize that the income stream from the annuity is suitable, but to act in your best interests, another investment that pays a steady dividend stream and keeps more money in your pocket is a better choice. Over time, financial advisors can build up a handsome book of business, and if that money isn’t in the safe hands of a custodian, even the most honest advisor may be tempted to abscond to a Caribbean island, never to be heard from again. Perhaps, that’s a little dramatic but throughout history, a litany of abuses have been exposed when it comes to minding client assets. And many stem from the absence of an independent custodian. You don’t want your financial advisor to also be the custodian of your assets but rather you should make sure they use a third-party, who is independent, so they can’t get tempted to to dip into the pool of monies whenever they feel like it. Ask your financial advisor the question, who is your custodian? Some custodians aren’t well known to the general public, so even if it’s not a name you recognize, google it later to verify it’s a respected name. Shocking as it may seem in this day and age, not all brokerage platforms provide dashboards that let you see basic information, such as your portfolio performance over time. Make a list of the top 3 things you know you will want to see when you log on to your brokerage account, such as portfolio performance, tax documents, and fee reporting. Then verify with your financial advisor that these, and others that are important to you, are accessible to you via your online portal. It can be expensive transferring assets from one advisor to another, so it is best to do a test-run to see what information you will have access to ahead of time. Some financial advisors demand that you transfer cash as a new client so that they can build a portfolio for you from scratch. But what if you had invested in Alphabet stock or Facebook stock when they came public and you are sitting on large unrealized gains? By selling these stocks, you may incur very significant tax liabilities, whereas if your assets had been transferred in-kind, the stocks would have never been converted to cash and no tax events would have taken place. So, be sure to figure out whether your portfolio of stocks, bonds, ETFs, and any other products are transferred in-kind, or need to be encashed first. If you have a history investing only in stocks, mutual funds have some surprises in store for you and they are not all pleasant. The idea behind a mutual fund is to diversify your holdings more easily than buying stocks or bonds individually. Instead of buying thirty individual stocks for example, you could simply purchase a mutual fund featuring those stocks. Companies like Motif make it easy to customize your own selection of stocks to form a motif, which mimics a mutual fund. You may be liable for tax payments, even if you didn’t participate in the gains! When you hold a stock, you may own it forever without paying any ongoing fees. But when you buy a mutual fund, the manager must be paid to oversee the fund, and operating expenses must be paid too from the expense ratio charge. Over time, these fees can add up and hurt long-term performance. It is also theoretically possible to buy a mutual fund in mid-December of a given year and be hit with a large tax bill the very next day. So, if your financial advisor does invest in mutual funds on your behalf, ask them what the expense ratios of those mutual funds are and what tax liabilities you should expect to pay, if any. Financial advisors face a bit of a dilemma. To make more money, they need to take on more clients, but the more clients they take on, the harder it is to deliver quality service. A rule of thumb is that it’s hard for a financial advisor to serve more than 150 clients at any one time. Now, if you join a firm that has many advisors, they may obviously be able to handle many more clients, but any single advisor is probably limited to about 150 clients. Big, brand name firms often serve fewer clients because they target ultra-wealthy individuals who demand more attention. But for the ordinary Joe or Jane, an advisor will probably be tapped out when that 150 threshold is met. So, if your advisor tells you they have more than 150 clients, you should ask them how much attention they will give to your portfolio. After all, if they serve more than 150 clients, they can probably only attend to your portfolio for at most a couple of days a year unless they use standardized model portfolios that are similar across all client portfolios. And if they have just 5 or 10 clients, you might want to ask how much experience they have investing money on behalf of others because they might be new to the business. Robo-advisors rely on computer algorithms to build client portfolios so they are not limited to the same extent as are human advisors. If you are investing your money with a financial advisor who has a single person practice, you should make sure to ask them what happens to your money if something happens to them. Also, if your financial advisor has more than a few grey hairs, you might want to ask them what their succession plan is and how they will transition assets to a new advisor when they retire. Handing over a financial advisory practice can be a sticky business because the financial advisor selling will almost certainly value the practice more than the buyer will and so negotiations can stall. The last thing you want is for your assets to be in limbo and not managed while your financial advisor is distracted negotiating a succession plan. Some clients are hands-off and want their financial advisor to not bother them unless absolutely necessary. Others prefer to be involved in every decision. When you meet with your financial advisor, ask them what the profile of their clients is – are they hands-off? What age are they? What is their average risk profile? An off-the-shelf solution is not right for everyone, so if your financial advisor has a cookie-cutter approach to serving clients, you might want to look elsewhere if you are getting close to retirement. On the other hand, if you have many years to retirement and don’t have especially complex circumstances, then perhaps a cookie-cutter approach is all you need and want. Regardless, make sure that you and your financial advisor have similar objectives for your portfolio so that your working relationship will be a mutual fit. >> Should You Buy Or Sell Google Stock?